BRIDGING THE HUDSON AT POUGHKEEPSIE. A glance at any map of the Eastern and Middle States will show the need of a bridge over the Hudson River at a point midway between New York and Albany. All traffic between the New England States and the West and South over either of the lines having a terminus at Jersey City is subjected to more or less delay, caused by crossing the Hudson at that point. The Poughkeepsie bridge, together with about twelve miles of road to be built between Poughkeepsie and Gardiner, will obviate this difficulty by making an almost direct route from Boston and Springfield to Scranton and the anthracite coal fields and Harrisburg. The advantages to be derived by the transportation of coal over this route, and by the passenger and freight traffic between New England and the West and South, are apparent. The Poughkeepsie bridge has four piers in the river. These are of masonry resting upon timber caissons, which are dredged down to about 125 feet below high water. These caissons are 60 feet by 100 feet, with twelve pockets left open for dredging, and which will be filled with concrete after the caissons are sunk. The masonry will be built on grillages, 46 feet by 100 feet by 10 feet deep, with temporary sides. These will be sunk to rest on the top of the caissons, which will be 20 feet below high water. The masonry piers are 24 feet thick and 86 feet long, and their tops will be 30 feet above high water. From that level to the lowest point of the superstructure100 feetwill be steel towers, 16 feet by 60 feet on the base and 16 feet by 30 feet on top, made of eight columns well braced together in all directions. The wind pressure provided against is 30 pounds per square foot upon the exposed surface of the spans and towers and the area of the trains. The spans are provided to carry a train load of 3,000 pounds on each track, beaded by two consolidation locomotives of 85 tons each, with factor of safety of 5. The pressure on the caisson bases is about 3 tons per square foot, and the material upon which they rest is hard gravel. The principal changes from the original plan of this bridge, as designed some 15 years ago, are, substitution of steel towers for masonry, which diminishes the pressure on foundations very much; substitution of three cantilever spans of 548 feet each and two connection spans of 525 feet each for five disconnected spans of 525 feet each. This change enables the Union Bridge Company to erect the three cantilever spans without staging in the river. It also gives more waterway between the piers, and a clear height of 160 feet instead of 180 feet in three spans. Ultimate strength, 66,445 lb. per square inch. Elastic limit, 36,063 lb. per square inch. Elongation in 8 ft., 21 per cent. Elongation in 12 in. at point of fracture, 37½ per cent. Reduction of area at point of fracture, 51 per cent. All broke in the body of the bar. These were tested on the Union Bridge Co.'s 600 ton testing machine at Athens, Pa., at present the most powerful testing machine in the world. It is expected to pass trains over this bridge before December 31, 1887. 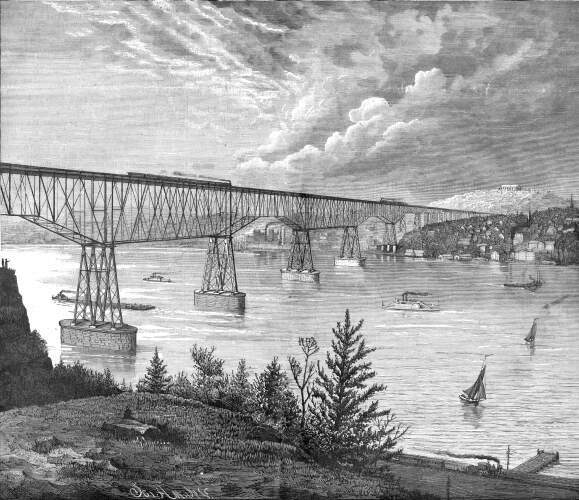 When it is considered that the river part of this bridge is equal to three cantilever bridges of longer span than that at Niagara, and of about the same height, and with three-fourths of a mile of viaduct on the shore, making in all about one-and-one-third miles of double-track bridge, the task appears to be a great one; and yet it will be done. The cost of the bridge will be about $2,500,000.